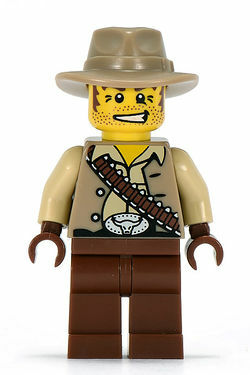 The Cowboy is a minifigure that was introduced in 2010 with 8683 Minifigures Series 1. The Cowboy has a tan coloured fedora similar to the one worn by Indiana Jones. He also has two dark grey revolvers as accessories. He has brown legs, a shirt with a tan coloured vest and an ammo strap printed on the torso (Similar to Jake Raines') as well as a bull belt buckle and beige arms with brown hands. An extra revolver is included.